The line of saffron stretched as far as we could see, a solemn procession of monks walking quietly along the street. The monks ranged in age from young boys to older men, and as we watched them in silence, an elderly monk asked, "Are you American? I'm from Wisconsin." The disparity between the ancient and the modern, the sacred and the profane, the solemn and the commercial sums up the mystery which is Laos. The old city of Luang Prabang, once a royal capital, offers even the most jaded traveler an experience in extremes. The older monk who approached us was part of an ancient daily ritual whose origins stretch back in time. In this city of believers, the population takes care of its monks as they take care of the citizens. Each morning at dawn, the monks thread through the streets silently carrying their food buckets. Along the route, the townspeople (and an occasional tourist) sit quietly and offer their food to break the monks’ fast. The ritual is performed in silence, which is why we were surprised at the question. Laos is a study in contrast, and for each ancient ritual, there is a modern incongruence, such as a desire to practice English in the middle of a holy ritual. 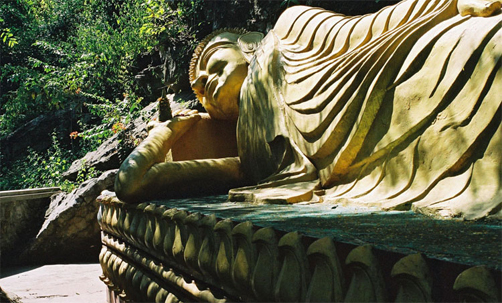 The monasteries hold a deserved place of pride in Luang Prabang for good reason. During the Vietnam War, Laos endured more US bombs than either Vietnam or Cambodia, and many children were orphaned. The Buddhist tradition requires caring for the poor and indigent, and thousands of young children were taken in by the monks to be raised and educated. The townspeople know the goodness of the monks, and for centuries they have fed and supported the monasteries and revered its inhabitants. Even the familiar saffron robes of the Buddhist monks are provided by the town. Each time there is a death, the family lays out extra shrouding for the cremation. After the body is burned, the monks come to collect the fabric. They then color it in a mixture of dyes: black for death, red for blood, and yellow for pus. Each of these colors is a reminder of our own mortality, and the eventual shade of the robe is determined by the amount of each color which is added. (Creating) Ecotourism in West Virginia- and you can, too!